This handsome native ornamental has showy white flowers, glossy, dark green leaves. 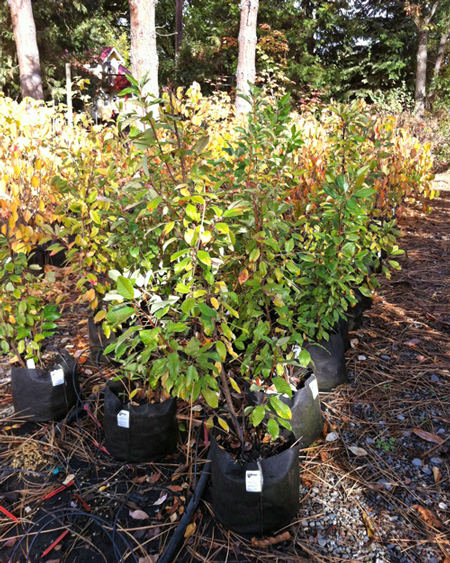 Sometimes a thicket-forming shrub, in its tree form, Douglas Hawthorn can grow to thirty feet. Its stout branches develop into a compact, rounded crown. Leaves are sharply toothed, but unlike the invasive species that have escaped from cultivation, these are only slightly lobed. The fruit is crab-apple size, very dark red or purplish, looks black. Fruits provide food for wildlife, and its dense habit makes it a choice nesting site for birds. Twigs are shiny red, with stout, 1" thorns. A good plant for sunny, dry slopes, but give it some water until it is established.